Crews set up scenes in the front yard of Swan House, which was used as the set for President Snow’s version of the White House. The Swan House in Atlanta’s Buckhead neighborhood is a 1928 Classical mansion and onetime home to the Inman family, whose wealth helped to rebuild the city after its destruction during the Civil War. 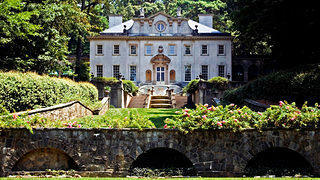 More recently, the house, designed by Phillip Trammell Shutze, has become the home of the Atlanta Historical Society, and even one of the sets for the 2013 film "The Hunger Games: Catching Fire." I sat down with the Swan House’s Brandi Wigley and Jessica Rast to get the scoop on the house’s history and its role in the blockbuster film. Tell me about the Swan House. It is a Classical mansion. 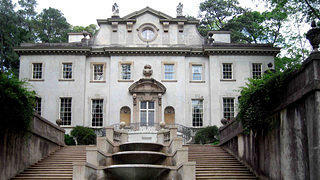 The architect, Phillip Trammell Shutze, was considered at one point as one of America’s best known classicists. The house was completed in December of 1928, and the Inman family commissioned it and lived there. [But the name comes from] a swan motif throughout the home, as in swan, the bird. It was one of Mrs. Inman’s favorite things. Swan House was built in 1928 as a Classical mansion. It’s a good story because it really has a lot to do with the rebuilding of Atlanta. After the Civil War, Mr. Inman’s grandfather and his family come to town and they are in cotton brokerage and all of the businesses and industries surrounding cotton brokerage [like] railroads, real estate, steel, you name it. And so while they are building this great family fortune, they are helping to rebuild the city. They’re really one of those families that come in and make Atlanta the town it is today. Mr. Inman was not only involved in business, but in a lot of the political decisions as well. He serves in local politics as an Atlanta city councilman, Fulton County commissioner—which is the county Atlanta sits in—and he also serves President Wilson during World War I on the War Industries Board. And no surprise here, he consults on cotton prices around the world. A really great quote I read one time was, “Not a bale of cotton moved around the world without the Inmans' approval." And Mrs. Inman and her mother were major women’s suffragists here in Atlanta, and they actually were getting Atlanta ladies the right to vote before the rest of the Southeast. Roses feature in the formal gardens that surround the home. 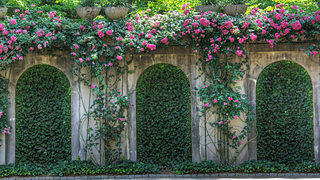 Another view of roses along the garden wall. Any interesting stories about the house? The thing about Swan House is that it was designed really as the Inmans’ adult home, so they didn’t plan on having children in the house. But Mr. Inman passed away three years after moving into the home. At this point, it’s a few years into the Great Depression, and Mrs. Inman asks her family to move in. So her grandchildren actually grow up in the house. One of the best stories of the house is that Mrs. Inman asked her family not to use the grand staircase because she wanted to protect it. So she made her family use the servants’ staircase in the back. Film crews took over the property for roughly three weeks. 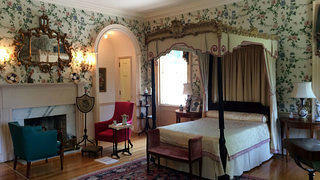 They chose the house specifically for its history and antique furniture. Why was the house chosen to be a set for "The Hunger Games?" 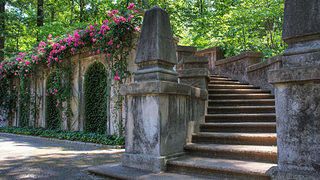 The location folks for Lionsgate were looking to film "The Hunger Games: Catching Fire" in Atlanta. They chose the Swan House as [villain] President Snow’s mansion because it’s Classical and it still has the original antiques. They wanted something that looked like it had been there forever. We like to joke now that Swan House is the Presidential Palace because Snow is the President of [the country of] Panem in the movie, and so it kind of functions like the White House would today. What was it like having them film there? They were on the property for about three weeks. It was pretty exciting. We spent a lot of time with the production team before they arrived to discuss how they would use the house and how they would protect it. We actually had sets built on the front lawn. 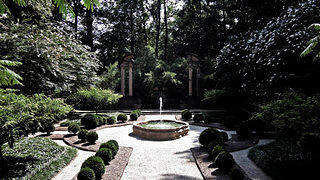 We had sets built in some of our gardens. As far as the interiors of the rooms, some of them got entirely new looks, they were transformed completely, and there was actually five days of filming. Swan House’s gardens were also used as sets for the film. This story has been updated from its original version to remove information that is no longer relevant.